Having any building work done on your house can be incredibly disruptive – but just how bad will it be when you have your loft converted? Is it OK to remain in the house while work takes place and what can you do to prepare for the situation? Builder Bill Martin is an expert in loft conversion. He is one of the directors of G&M Loft Conversions, based in Braintree, Essex, and has worked in the loft business for 30 years. His operation covers the whole of Essex and parts of Hertfordshire. Q: What sorts of lofts do you convert in the course of your work? A: We carry out a range of different loft conversions in all sorts of different types of property, of varying styles and ages. The lofts, therefore, vary greatly in their design too. The conversions we work on could be anything from a project that will see us creating an additional bedroom in a terrace property to providing a games room in a detached house. 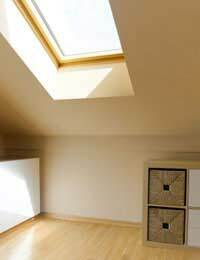 We have worked on loft conversions of all sizes. One recent project saw us create four bedrooms and two bathrooms in the loft of a bungalow. Q: How long does the average loft conversion take? A: It does vary obviously, depending on the size and complexity of the project, but an average conversion should take approximately six weeks. Q: Should the whole loft be emptied by the property owner before work starts? A: Yes. The owners should prepare by clearing everything out of the main loft area. They also need to ensure any cupboards in the eves are emptied. The space must be completely clear prior to the commencement of work. A: The most important thing is to empty the loft and ensure access is good. It needs to be easy to move through landings and hallways etc. Otherwise, the builder can take care of everything else. Q: Should the homeowner move out of the property? A: It is highly unlikely that the homeowner will actually have to move out of the property. In the vast majority of cases we work while the people are still living there. We do try to work with minimal disruption to the owners but obviously they do need to account for the fact that people will be in and out of their house during the period of the conversion. Q: Will water, gas and electricity need to be disconnected? A: No. Again, we try to cause as little disruption as possible. If at any point we do need to turn off the electricity or water we will inform the homeowners as necessary but the utilities certainly do not need to be disconnected. Q: Do you have any other advice for anyone who is about to convert their loft? A: Yes. It is important to think carefully about the project before you start. Try to have a clear idea of the type of space you want to create – and get advice from the experts. We provide a complete design to build service, which means we can offer advice and support throughout the whole process. Make sure you have left plenty of time to clear your loft before the builders arrive. That way there is no last minute panic.